The Valley. Yosemite National Park. A Willy Nilly Map. 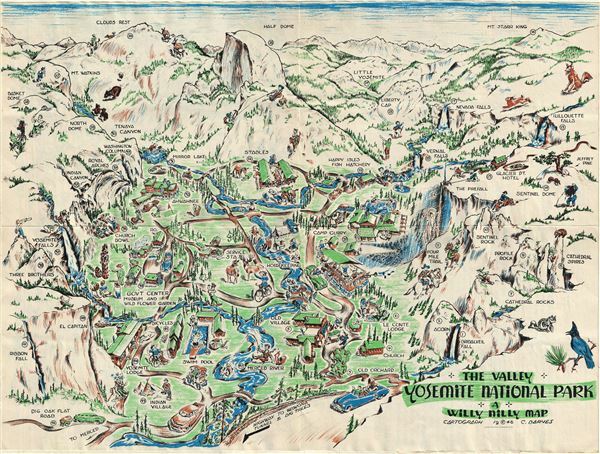 This is a whimsical 1946 pictorial map of the Yosemite National Park, California by C. Barnes. This beautifully illustrated 'Willy Nilly Map' covers the Yosemite National Park noting several landmarks and places of interest, including Half Dome, Clouds Rest, Little Yosemite, Indian Village, etc. Wildlife and park life is depicted in vignette cartoon illustrations. Located on the western slope of the Sierra Nevada Mountains and comprising of only 1% of the Yosemite National Park area, the Yosemite Valley is the most attractive and the most visited part of the park. Formed over millions of years of interaction between glaciers and rock, this U-shaped valley still undergoes dramatic changes with constant erosion, rock slides and avalanches. The verso of this tourist map, intended to be folded and mailed, contains a checklist entitled the 'Yosemite Boasting Chart,' with a list of must-see sites. Verso also includes a map of the High Sierra country surrounding the Yosemite Valley. This map was drawn and copyrighted by C. Barnes in 1946. Very good. Original fold lines visible. Minor verso repair in upper left quadrant. Pictorial map of High Sierra Country and Yosemite Valley checklist on verso. Souvenir map originally intended to be folded and mailed. Checklist contains manuscript notes, most likely by a tourist visiting the park.